It’s Monday and I have many things to share, one food and the rest just exciting news! First the news! Over the past few days, Naturally Ella underwent a major organizational overhaul. The recipe page and all of the resource pages now have photo indexes! Be sure to pop over to the home page as well to see what’s new! Melissa and I launched our first client’s site this morning and we couldn’t be happier with how it turned out. We were lucky that Alison from This Homemade Life decided to be our first client. I’ve always admired her gorgeous photography and couldn’t wait to work with her. If you haven’t checked out her blog, you now have two reasons! Finally, both Melissa from The Fauxmartha and Wooden Spoons Kitchen has a cyber Monday giveaway going on! Be sure to check out each one! Whew! To the food now! Recently I’ve been attempting to be better about eating leftovers and for the most part, I’ve done well. In fact, I often make enough so I can have lunch the next couple of days after the primary meal. Where I still struggle, however, is with ingredients I open that go bad quickly. I’m guilty of opening a can of coconut milk, using part for a recipe, and then letting it sit until I forget about it. Or that pasta sauce I made the other night for pizza that conveniently gets shoved to the back of the refrigerator and lost for what feels like forever. This is my direct attempt to not do that anymore. I posted the recipe for Lentil and Spinach in Masala sauce, which left with with approximately 1/4 cup of the paste leftover. Not enough to make the main dish again but just enough to sit in my refrigerator until I forgot about it. I think this dish is just as good as the parent dish. I love spicy foods and there aren’t a lot of spicy breakfast foods out there. Plus, this comes together super fast when the paste is already made. It’s the perfect breakfast that doesn’t even feel like I’m eating any leftovers! In an 8″ cast iron skillet, heat olive oil over medium low heat. Mince garlic and add to olive oil, cook for 1 minute. 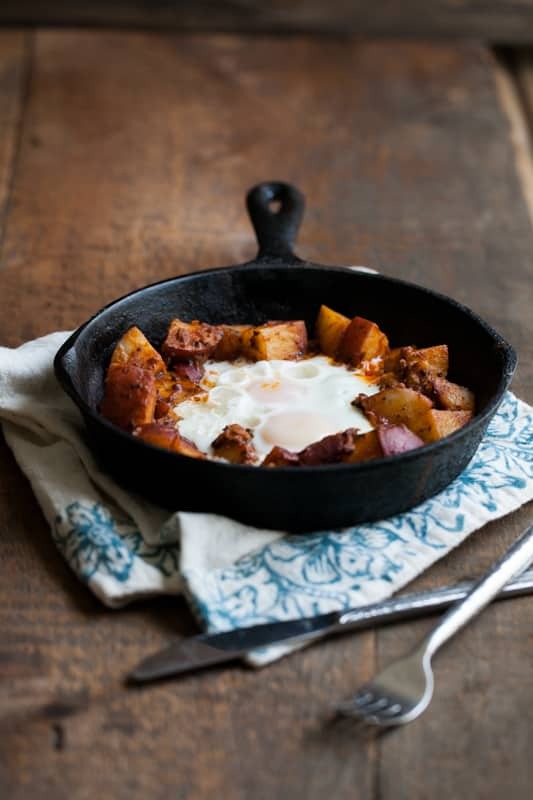 Quater red potatoes and toss into skillet. 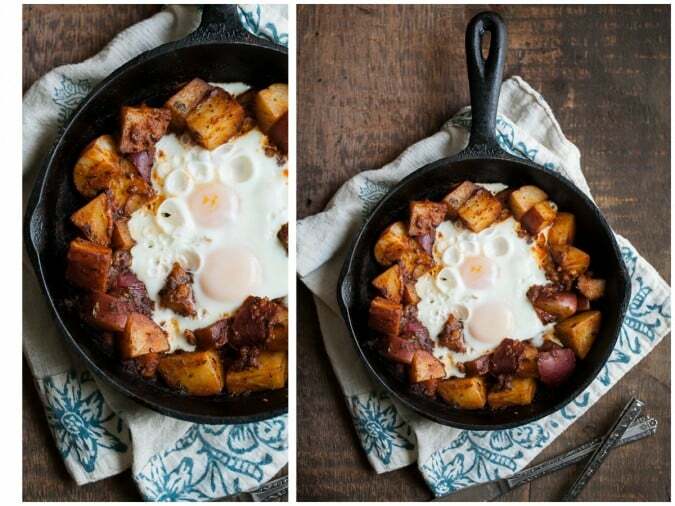 Potatoes should form a single layer in skillet. Cook for 2-3 minutes. Stir together paste and veggie broth. Pour in to skillet and toss with potatoes to coat. Cover and let cook until potatoes are tender, testing occasionaly. 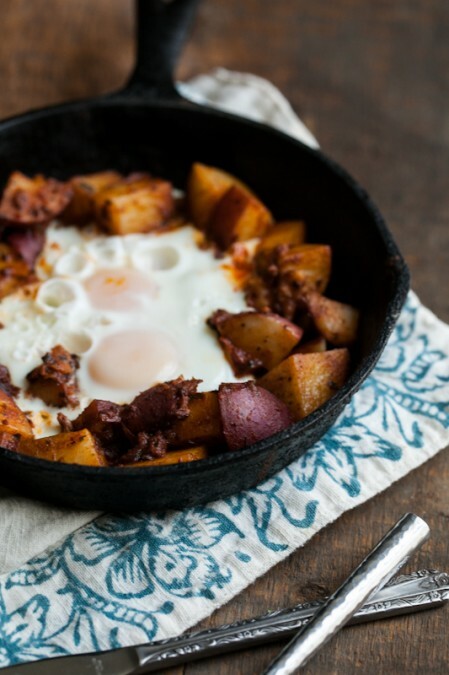 Push potatoes to the sides and crack two eggs in the center. Cover and let cook until egg whites are set and yolk is desired consistency. Lovely way to use up leftovers! 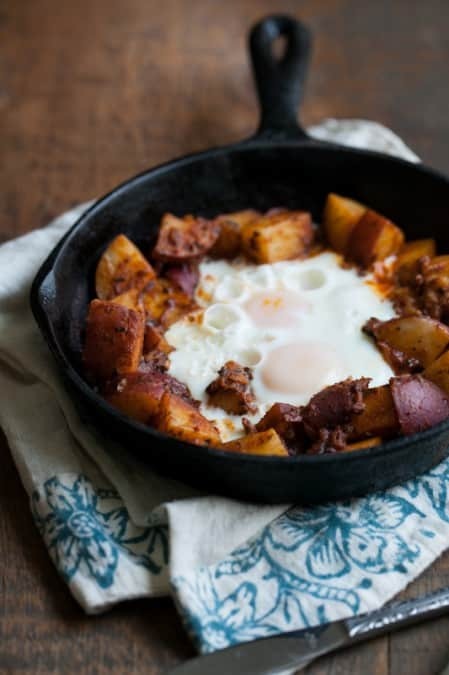 I love breakfasts like this – spicy potatoes, yum! This looks perfect in every way! Bring on the potatoes! And I love your first site design – so pretty! Your new site design looks awesome! Alison’s site looks beautiful as well. Congratulations to you and Melissa on beautiful work! I LOVE this so much, the photo indexing on the front page, etc etc etc I’m drooling. I spent a couple days working on my site, with things like this in the back of my mind, but of course having no concept of how to bring it to fruition. And this recipe? Looks delicious!! Can you tell me where you snagged that skillet? I snuck around on my girl’s pinterest and discovered that it makes her swoon. Thanks much! Aww! I actually got mine at an antique store but it’s just an 8″ cast iron skillet- you can get them pretty much anywhere!